Old Masters Houses is an examination of residential architecture as it appeared in the art of some of the painters of the past. Most of the old masters did not paint houses. Lucky for me some painters focused on scenes of everyday life and for this I am extremely grateful. In the early years it seems that only Dutch painters brought this type of realism to the canvas, but as time wore on this style became increasingly common throughout Europe and the New World. Jan Vermeer was one painter with a penchant for recording the world around him. He mostly painted indoor scenes, and we will meet him again when I focus on interiors, but here is a close-up view of the city of Delft in 1658. My family used to own this painting. I am not claiming we owned a Vermeer, but we owned this painting. My parents bought it cheap in Belgium about 1966. When I say cheap I mean under $100. When they had it appraised in about 1985 they were told that it was from the school of Vermeer but the appraiser thought that Vermeer himself might have painted some of the bricks. Okay, my memory might be playing tricks on me, but that is what I remember. Anyway, according to Wikipedia Vermeer had no students, but he did become President of the local Artists Guild, so it is possible that he helped train up some apprentice painters within the Guild. By the way, I think my parents sold it for around $4,000 in the 1980's. I remember that it was painted on wood, and on the backside of the wood there were various cryptic marks that probably meant something to some auction house. I remember also how excited I was when I came across our painting in encyclopedia or text book. We owned something famous! 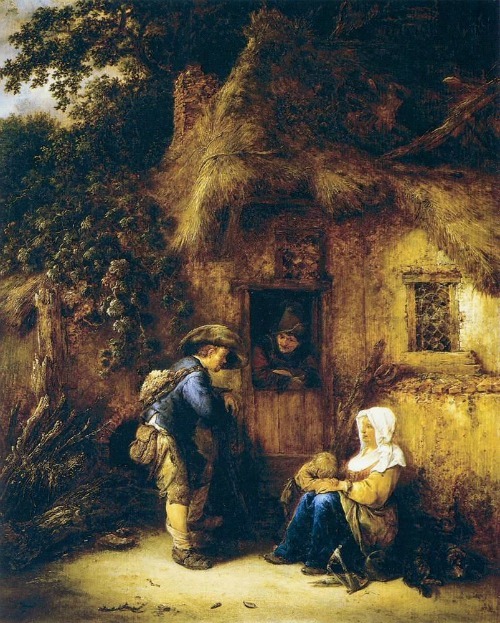 For the moment, however, let me look at this painting clinically and see what we can learn about old houses. The picture is of a street in Delft. 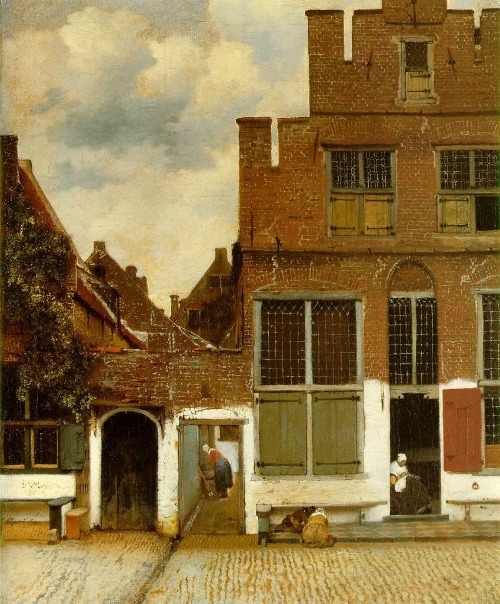 Delft was Vermeer's hometown and he did not stray far from it. He not only painted in Delft but he owned an art gallery. As I consider this painting, a few things strike me. The building is not new. There are cracks in the facade and they have been repointed. I find it curious that the lower floor has been whitewashed and this covers the neighbors house as well. It hasn't even been well done. The top edge is uneven. This seems like a curious practice and I wonder why they would do this. Here we have another case of the shutters only covering part of the windows. The windows are all in two parts with the lower part getting the protection of the shutters. It is possible that the upper windows did not open and the shutters were a security measure. Since the lower windows could be opened the shutters provided a means to prevent someone from forcing the windows open from outside. There is more to this, but for the rest of the story we will have to wait for my articles examining the interiors. Notice how large the windows are and how much of the house is open to the sunlight (or would be if the shutters were open). Compare this with the houses in the smaller towns painted by Bruegel and Ruisdael in my opening page of this series. The town homes have a lot more window. On the house on the left we can see the roof tiles and it appears that the roof had red clay tiles. These would have been more common in town than in the country and were probably required as a form of fire prevention. Note the top two sections of the house on the right. There are little black lines that are almost vertical. These are actually iron stays that help hold the house together. They would have been fastened to an iron rod running the length of the house until, on the other side of the house another stay would be fastened to the other end of the rod. The purpose was to prevent the bulging of the wall. I have seen these used many times on old buildings, but I am not sure if they were built in from the beginning or only added later, when bulging became apparent. The open door in the middle actually appear to lead into a side courtyard. You can see a women working well beyond the door and she is well-lit, so I think there is no roof over her. Compare that to the dark entrance in the doorway just to the left. That appear to go into a room rather than a courtyard. Note also that the house goes right up to the street. Setbacks were not the norm back in the day. The modern day idea of a house with a yard is just that, a modern day idea. Houses went right up to the street. Any yard, if there was one, was in the form of an interior courtyard. Vermeer wasn't the only artist that included houses in his paintings. There were several of his generation. The next one we will look at is Isaac van Ostade. Isaac and Adriaen van Ostade were brothers and painters, and not surprisingly there is a similarity in their work. Adriaen will show up later in this study of Old Masters. Here is another ice scene. 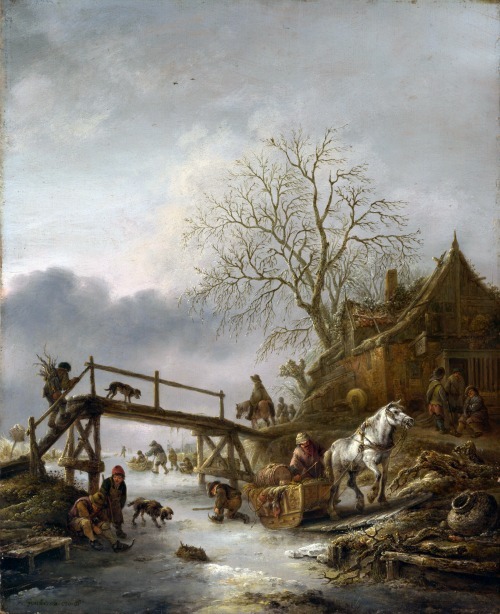 The "Little Ice Age" had struck Europe and the Dutch canals all froze over. Skates and sleds were the order of the day. Fortunately Isaac van Ostade decided to help set the scene with the inclusion of this house. It seems to be a little ramshackle, and it is unfortunately a little too far away to be able to soak in the details. It does have a dormer window, which we haven't seen too often in these Dutch paintings. The roof seems to be a little thin to be thatch, but one detail make me think that it is. Fairly close to this end of the roof two poles are laying on the roof and cross at the peak. This was a relatively common way of helping to hold thatch down against heavy winds. I don't know that this would have been used on a wood or tile roof. The roof itself is not flat across. 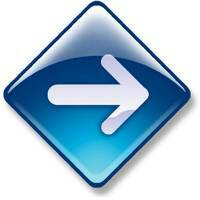 It is slightly concave, so its slope is shallower closer to the lower edges. There is almost no overhang or eave to the roof. The windows are all very small and most are closed with shutters. On the gable end facing us we can see a post, part of the timber framing, that goes straight up to the ridge and extends beyond and appears to be carve to a point. This may actually be a carved ornament tacked on to the top of the post rather than being part of the post. Either way it shows that there was a touch of artistry in the original construction of this house. Here is another Isaac van Ostade painting. Here we get some detail on one of these country homes. We saw in the Bruegel paintings roof lines that seemed low by modern standards. Here we can put some measurements to the roof. The traveller in this photo can reach up and touch the thatch. If he steps back a few paces his hat would brush the thatch. This reminds me of Christopher Alexander's pattern #117,"A Sheltering Roof". He recommends bringing the roof down as low as the doors in places, and this is exactly what was done in this painting. The roof speaks of shelter and bringing it down to our level makes that shelter seem both accessible and comfortable. We also see what is often referred to as a "Dutch Door". Notice how it makes a great place for conversation. It also acts like an extra window. One thing I admire about this house is the way it blends in with nature. There is some kind of vine or trailing rose bush growing right up over the roof. 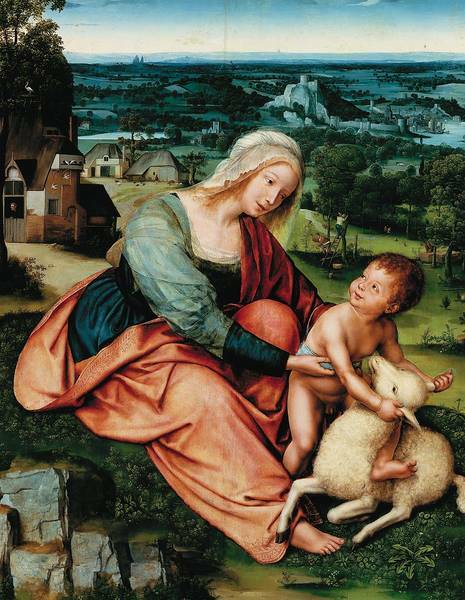 About 150 years before the above gentlemen a painter named Quentin Matsys, or Massys, was painting in Amsterdam. He too eschewed the palaces in favor of the ordinary. In the above painting we have some remarkable houses quite unlike the ones above or the houses we encountered with Pieter Bruegel the Elder. First lets consider the two houses in the mid-background. They are both thatched and in both cases the roof extends to very close to the ground in places. The structure on the left has a dormer window along the outer wall. The two structures seem to be connected, so I think the one on the right is actually a barn. Moving closer we see a very unusual house. There is a tower portion to the house, with some small openings in the wall. If you look closely you can see birds flying, so I think this is a dovecoat. It is essentially a barn for doves or pigeons, and usually a sign of a person of means. If we look closely we can see that the roof actually goes up higher than the dove coat and there is a window very near to the top part of the roof, although it is in the shade and difficult to see. At the ridge of the roof we see a platform and a crane or egret nesting on that platform. If you consider the size of the doorway you can see that the roof goes up nearly three stories, but having only the one window up high suggests that most of that attic area was not used for rooms. The doorway is interesting. It appears to have a carved bargeboard decorating the gable and this looks nearly indentical to some of the bargeboards used in the Carpenter Gothic homes in the United States in the early 19th Century. My assumption had always been that the carved bargeboard was imitating Gothic entryways made in stone. Now I have to consider the idea that the 19th Century bargeboard was imitating 16th Century bargeboard which was imitating Gothic stonework. In the next article we will move to house interiors, but we will get back to the exteriors later.